AgileBits today is releasing 1Password 7 for iOS with several new features, just one day before the iPhone X launches around the world. 1Password has been redesigned with the iPhone X's new screen size and dimensions in mind. 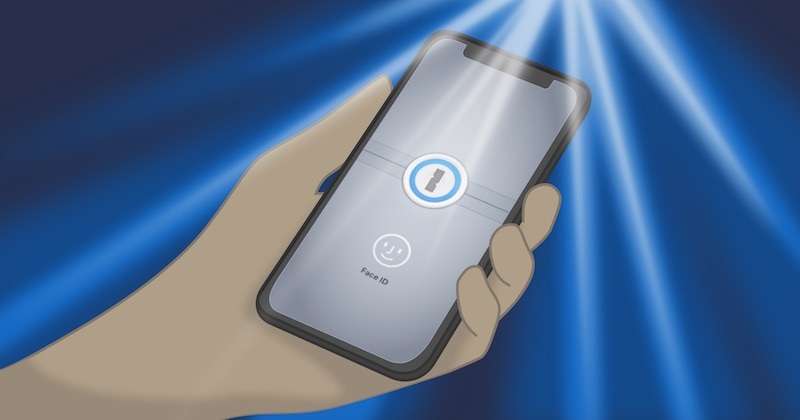 The app now supports Face ID for unlocking with the iPhone X's facial recognition system, in addition to the existing options of using Touch ID on older iPhone models or manually typing in a master password. An all-new feature called Quick Copy makes it quicker to copy and paste usernames, passwords, and one-time passwords into apps that don't support the 1Password extension. Simply open 1Password, copy the username for an app, switch to that app, paste your username, and then switch back to 1Password. Without needing to do anything else, 1Password will put the password on the clipboard, meaning you can switch immediately back to the other app and paste it. If you're logging into a site or service that supports one-time passwords, you can repeat the same app switching process to quickly get the one-time password. 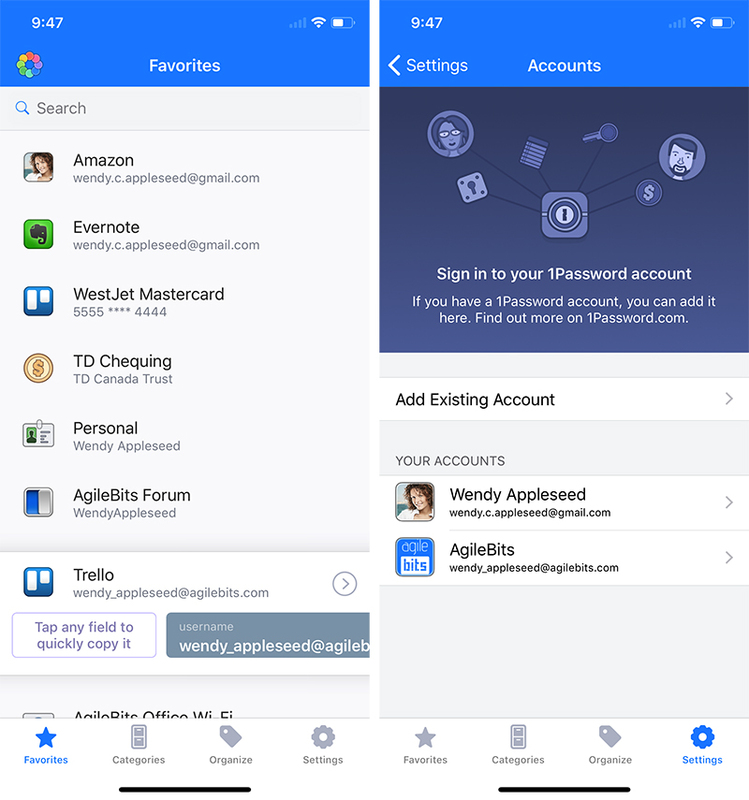 1Password 7 also has a redesigned Favorites tab with drag and drop support on iPads running iOS 11 or later, support for Handoff across iOS devices, keyboard shortcuts for external keyboards, and a slightly refreshed app icon. 1Password is a popular password manager for securing usernames, passwords, credit cards, addresses, notes, bank accounts, driver's licenses, passports, and more behind one master password, with end-to-end encryption. A built-in password generator lets you create strong, unique passwords and memorizable pass-phrases. 1Password 7 will be available today as a free update on the App Store for iPhone and iPad. An individual subscription costs $2.99 per month, which includes hosted service across Mac, iOS, Android, Windows, and 1Password.com. Disclaimer: I work for AgileBits, makers of 1Password. Simply update the app and it's the same as before in this regard. The only window you'll see, and it's a one time window, is a "What's new" list. It gets dismissed by you and you'll never see it again. We hope to do this for each major release going forward I think. (7.1, 7.2, etc) to let people know a bit more about the major new changes. Just as before, you can still purchase the Pro features for standalone usage. Or you can sign up and create an account for the subscription. Literally nothing changed with this between version 6 and version 7, aside from the fact we support Apple's new purchase in-app purchases from iTunes instead of directly in the app which came as part of iOS 11. Wait. $3 per month? Is this an option or now mandatory? Been a 1Password User for years, but if this is going subscription based I'm out. It's an optional service. We wanted to offer a much better solution for users and the only way to do that was with a hosted option. It is optional but it is also the best experience for using 1Password. But you're under no obligation to switch to it or use it unless the features it offers are worth it to you. ...how much do they want this time? I removed all apps that try to go subscription model. This is ridiculous. It's a free upgrade for anyone that has purchased our Pro features, using a subscription, or were using the free version. Nothing changed in this regard. Awesome! 1password is an awesome app and have been using it for many years now. You will have to pry it from my cold, dead hands. Lol. I've been using 1Password (paid) on mac, iPhone and iPad without any issues so far. I think paid licenses aren't offered anymore but are grandfathered in for a period of time. I don't remember for how long. When that time comes I'll probably just transition to iCloud keychain. I already have been using that for a while and 1password is just sorta a fallback. Licenses and standalone purchases are still offered for Mac and iOS. We'll be bringing it back for the Windows application with the launch of 1Password 7 for Windows. Except for those of us running IOS10...this new version requires ios 11..
We have historically always supported the latest iOS. For the last couple releases we have been supporting back to iOS 9 but we've also been holding ourselves back. Every iOS release includes great new tools for developers, we can replace our own code with new code from Apple and reduce the amount of code we have to maintain. Making an app work across multiple iOS versions can often add complexity and more to maintain. This year we decided to go iOS 11 only because it made sense for us to keep pushing forward and not holding ourselves back with older versions. Does it have the ability to add images to items? Or do I still need 1Password 4 to do this? For those using our 1Password.com solution they can add Documents (this was added in 1Password 6). We do not allow adding attachments to standalone vault items in this release. Sorry. We still offer standalone licenses. I Own Pro-tier of 1Password on iPad, iPhone & Mac but don't have an AgileBits login, just use iCloud sync and it's treated me well. Thanks so much for the reply. I'd like to add you are in a group of only 10 developers out of 150 apps installed on my iOS devices who publish actual release notes and I REALLY appreciate it. "Bug Fixes" is the default for everyone now and then you launch the app and they've added advertisements or removed a feature I relied on and it's infuriating. so please keep it up if you can. Thanks for this! I'm often the one who puts the release notes together during our beta releases, which get bumped up for the final releases. I don't do the writing before the release notes, but it's my job to handle the actual changes portion :) So it's nice to see someone appreciates that! Thanks for the kind words. You're not "grandfathered" in. We still sell the Pro features separately. So new users can still purchase the exact same thing you have. The subscriptions are an option, but they are not the only option. Hi Kyle. Thanks for commenting here. I'm also a long time user of 1Password (Pro) on MacOS and iOS and really like your product. I hope you continue to offer perpetual license for your product as I would be in the crowd that would not go SaaS. I would however buy a new version if you were to charge separately for 1Password 8 (again as perpetual license); I do not expect to receive maintenance forever riding on my original purchase. I just want your organization to see this feedback and realize there's a significant portion of your user base that will support you with a one time paid license but will not go SaaS if we were some day forced down that route. Hundreds, even thousands, of apps will be updated today with iPhone X support and new features. But lets advertise for this one! I love 1Password! Fortunately I bought it before the subscription plans so I'm grandfathered in. It's one of my most used apps and I'm glad it will be fully optimized for the iPhone X. I don't know how I'd manage my hundreds of passwords without it. Please, keep it private, keep it local, and look at KeePass. I've tried using KeePass, and I'm a developer, but it was misery for me. I'm glad it exists and I'm glad there are options, but there is no way I could ever give that to my parents and expect them to use it. And we offer a bug bounty program ('https://bugcrowd.com/agilebits') with a pretty massive reward for someone who can prove we aren't doing what we say we do. If you think we aren't doing things correctly I'd love to invite you to submit the proper bug bounty report so we can give you a nice payday. Thus far no one has been able to claim that reward. We are creative people and we like to be creative in other ways than just the app. I'm sorry if they're a bit lengthy for you, but that's why we started including the TL;DR. I suspect most people like yourself tend to skip to the section where each new feature/improvement/fix are listed though. Those are the real meat of the release notes. That said, we try to find a balance, and the description text will likely be longer for bigger releases like 7.0 and our normal updates will likely be a bit smaller. We just like to have fun though and having some creative outlets is great. Many of our users love these types of release notes but we certainly acknowledge they aren't loved by everyone. So I'll pass this feedback along to the rest of the team. Not exactly. I have access to the Apple Watch app, I can keep attachments in my vault, I can tag things, I can add custom fields, I can add multiple URLs, and I can add new vaults. It might be important to note that I had also purchased the Mac version. My iPhone doesn't seem to be able to do everything listed above, but several of them from what I can tell and I definitely use the Apple Watch app regularly and have never paid a dime for the Pro subscription. Grandfathered for a lot of "Pro" features. I think you've simply misunderstood me. We offer Pro features, which is how you get the Watch, attachments tags, custom fields, etc. We still sell this feature separately from our subscription option. Users can still buy exactly what you have today. Or they can purchase a 1Password.com membership. You are "grandfathered" in that you purchased the app when it was a paid purchase, when we went free with in-app purchase in 1Password 5 the features you mentioned are now only available to those with Pro features. We gave users who purchased the app the Pro features for free since they had paid for the app. It's the same thing in the end. You just purchased the app, not the pro features but it's identical. Right. My quibble with standalone experience is that managing multiple vaults is needlessly complicated. 1Password should backup and sync multiple vaults settings via iCloud. But that would make standalone experience almost as nice as 1Password subscription. Anyway, that does not diminish my overall satisfaction with 1Password. I just wish 1Password 7 was more deserving of major version update. The problem is that this requires logging into various accounts first. For instance, lets say a user has an iCloud vault and 2 Dropbox vaults. Perhaps those two Dropbox vaults are on different accounts as well. So the user has to be signed into iCloud, Dropbox Account 1 and Dropbox Account 2. We cannot automate this process at all, nor can we really easily keep track of this information. For instance, App Developers do not have the ability to see "which" account a user is signed into via iCloud. We can get some information about Dropbox but we really try not to store information that is identifiable about our users. It's not an easy thing to solve. I had come up with a number of ideas similar to yours but every time we rolled through those ideas it just felt a lot better to have a real account that users signed into once and everything just appeared. This is why the subscription accounts are so much better in that regard. It's just easier. Sure it's not impossible to do for standalone vaults but we could never at all reach the same level of ease and seamlessness that we do for 1Password.com accounts. For iOS specifically, it's going to move a bit more seamlessly into each major version. Due to lack of upgrade type options we tend to roll features out as best we can as they're announced by Apple and make sure we come up with useful features that are unique to a particular major version. For instance Drag and Drop made sense so we released that in 6.9 so it was ready to go with iOS 11's launch. So the "version" number for iOS is going to flow in a way that makes sense for it. For Mac, we can do upgrades for it, so you'll see that type of thing looked at a lot more in the future and hopefully you'll see much bigger features and changes there. With iOS we don't need to convince people to upgrade because we can't do those upgrades. But for Mac, the next upgrade will have to convince people it's worth upgrading to, therefore it would have to live up to its major version number a bit better. Hope that makes more sense with regard to the versioning. We're still very proud of 1Password 7, it was not a small amount of work to get it where it is right now. But I am sorry that you don't feel the changes were worthy of a version 7 number. Any news on 1password 7 for Windows? I think if you explain things properly, people can understand. People can understand different choices on a menu. People can understand different choices in which "pro" or "regular" versions of other software companies offerings, so why not yours? Just be honest and upfront about it and show people all the choices. Again, it's about long-term money. Also saving on support cost, which again is money. It's rather transparent. And like I said, that's fine. You are certainly entitled to make as much money as possible with a product. But let's be honest, it just isn't about the user's convenience, but your convenience as well. And bonus...we'll make more money this way! We altered the wording, the page that describes both, we did a lot of tinkering and experimentation to try to get things right. We spent a lot of time trying to get it right. We provided charts to checkbox off the major important differences, an FAQ to explain things. There was a ton of work done to try to make them live side by side. It was up for months where we had them side by side. In the end we were spending a lot of time working on how to word something and explain it than we were working on features and bug fixes. At some point we may take another look at it but we felt that important time and energy making 1Password better was being spent working on something we actually had an easy answer to: Just present the best option for a vast majority of users. I don't see it changing at all until such a time as we charge for an upgrade though. And even then we may keep it a bit under the radar. I'm personally just thankful that the wording of that stuff is not my job because it feels very much like you can't win no matter what you do there. It's very much a damned if you do, damned if you don't situation. Understood, and thank you for taking the time to reply. My pleasure! We're excited to see version 7 for Windows as well. I know our Windows team is looking forward to providing features that our users have been asking for. Hopefully we'll have more to share soon. It would be great if they actually did that and spent a bit of time getting the new windows app out that supports drop box sync of vaults. Version 6 on windows does not support it so we are stuck on version 4. Too many companies jumping on the subscription model. It's a long time coming, still on version 4 on windows so that I can sync vaults. At the expense of us who don't want to upgrade our older devices to the latest OS because it slows the devices down. Sorry, we have different teams for Mac/iOS and Windows. Our Mac and iOS team handles that side, and we have another team for Windows. Work on 1Password 7 for iOS did not impede progress on our Windows application. With regard to Windows, it was a tricky situation. We had this 1Password 4 app and it worked really well for a lot of people. It was far from perfect but it provided standalone vaults and it worked. It was also pretty feature rich all things considered. The problem was that it was written in Delphi which just isn't super common these days. When 1Password.com service came out we had nothing at all for it for our Windows users. Our solution was to try to fully modernize 1Password for Windows. Bring it out from under the shadow of it's big brother 1Password for Mac. To do that we needed to fully rewrite it using modern programming languages and APIs. It's now written in C# and uses .NET to accomplish that. But our focus at first was 1Password.com because we had absolutely nothing for it and you can't sell a business solution (1Password.com includes a business component, called Teams) without a Windows application. So we knew we had to focus on providing an option for that as quickly as possible. So we made the decision to let 1Password 4 for Windows remain as a standalone option, focus 1Password 6 for Windows on 1Password.com and once it reached a point where it was viable there we could look at starting to re-integrate 1Password's standalone vaults into version 6. Turns out our timeframe for that was severely off. So 1Password 7 is where the standalone vault re-integration will occur. But it's a complete rewrite from the ground up. Our Mac application (and iOS by extension) have existed since the company started. 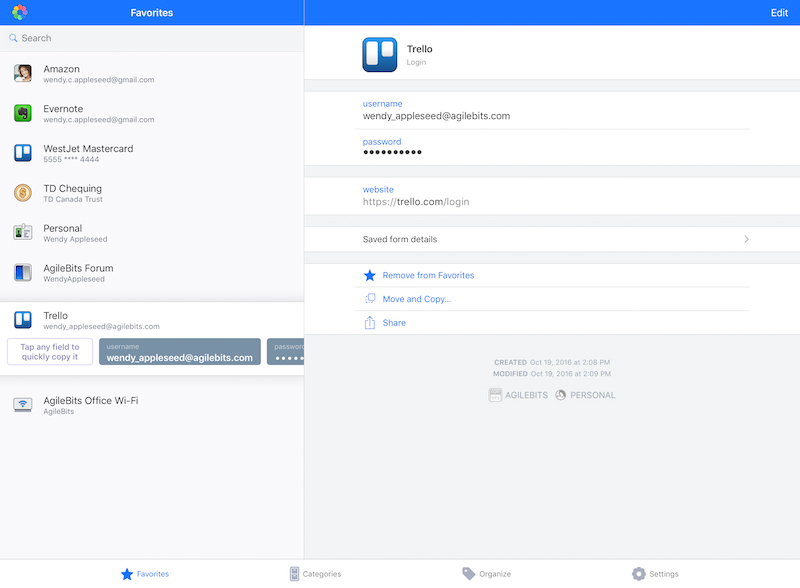 We've rewritten it a few times now (1Password 1, 3 and 4) and along the way have learned a lot and the design of the application is such that we have an extremely solid base that supports future changes really well. Our Mac and iOS team(s) are also much larger because they're the platform we started on and have the most users for. And shared code between Mac and iOS means if we build a feature for one, the backend of that feature can be moved over to the other pretty easily, with UI being the biggest changes. Our Windows and Android teams have no such benefits. Something written on Android has to be written for Android. Something written for Windows has to be written for Windows. But our iOS app gains benefits from our Mac app, and our Mac app gains benefits from our iOS app. Naturally these two are going to jump ahead and remain ahead for some time because they have a natural co-existance that the other two do not glean benefits from. Hope that helps give some insight. But we really want our Windows application to be something our users love and I think they've made some amazing progress given the short period of time they've had to work on it and how few of them there are. Hopefully it'll reach the point where you are happy with it sooner, rather than later. But I am sorry for the trouble. This particular rewrite is one we hope will set the groundwork for future versions and make it so our Windows application is something our users can be happy to use for a long long time.